This Deik cordless stick vacuum is a powerful and handy vacuum with a conveniently detachable handheld vacuum to offer versatility. This cordless Deik stick vacuum has many fantastic features to provide easy and convenient cleaning. It has the functionality of a stick vacuum, but it is easily converted to a handheld vacuum for smaller messes or tight spots. Lightweight design, 20-minute runtime, washable HEPA filter and headlights are all useful features that make this vacuum a good choice for a pet owner looking for a practical stick vacuum to remove pet hair. Click here to read real user reviews on Amazon. Yep, it looks a lot like the Dyson V6, and these two vacuums share many features. 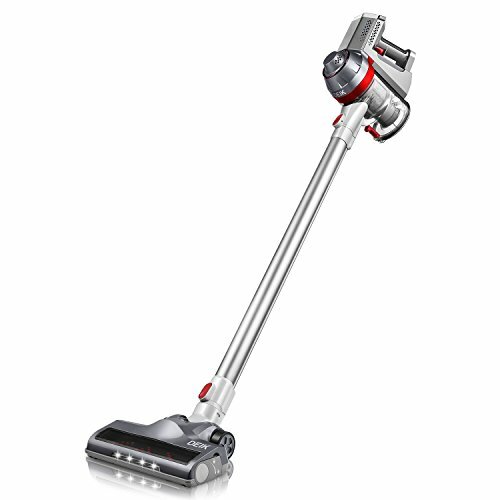 There are even some great additional features in the Deik stick vacuum, like headlights and a HEPA filter, which the Dyson does not have. It does, however, fall slightly short on performance when you compare these two stick vacuums, but the price is lower to match. At this price, the Deik is a good purchase, and it has received numerous excellent reviews from pet owners. If the Dyson tempts you but your budget won’t quite stretch that far, this Deik vacuum is a great alternative. The Deik 2-in-1 cordless stick vacuum offers many beneficial features and functions for pet owners looking for a lightweight and easily maneuvered pet hair vacuum to solve their pet hair problem. It is a well-thought-out ensemble with many details that make vacuuming easier and less of a chore. Deik is a less well-known brand manufacturing household appliances. They have fast growing product lines, and they are quickly becoming a recognized manufacturer of reliable quality products that last long and perform well. They offer a 30-days full refund policy and a 1-year warranty for all products, which speaks well for their trust in their products. This Deik stick vacuum has the lightweight handheld design made familiar by the Dyson vacuums. The design allows you to maneuver the vacuum easily between, around and under furniture, in corners, crevices and even reaching up to clean shelves, curtains or ceiling fans. Headlights enable you to see better when reaching under furniture to make sure not one pet hair is left behind. With a push of a button, you can switch from carpet mode to floor mode making it easy to vacuum all around the house on different surfaces. Or you can quickly detach the wand and replace it with an upholstery tool or crevice brush to clean sofas or baseboards. And when you’re finished vacuuming, you just release to bottom, and all dirt conveniently discharges from the dirt container. Easy and hygienic. There are some weak points in this product as well. We would like to see a motorized upholstery tool to make this vacuum more competent in removing pet hair from fabrics. 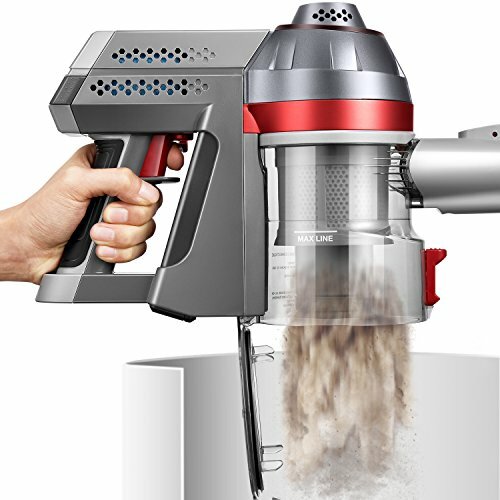 We would also like to see some of the upgrades Dyson did from V6 to V8; a system that ejects the dirt and hair from the container without having to pull it out even when the cup is packed full, and a longer run time to make this vacuum more useful tool for bigger homes. Looking at the bigger picture, this vacuum is not perfect, but the flaws users have found are only minor. At this price point, this Deik stick vacuum offers good value for your money and a very functional tool to help you get rid of that pet hair taking over your home. If you're looking for an affordable vacuum cleaner that comes close to the praised Dyson stick vacuums, this would be your choice. Let’s have a closer look at the key features. We pet owners know that our little hairy friends can be some messy roomies. There is the pet hair that you find under furniture and between the cushions, then there is the scattered cat litter, spilled pellets and dirt spread around after some digging in the garden. To clean after your pets without sweating, you need to have an adaptable vacuum, and the Deik 2-in-1 is just one of those all around vacuum cleaners. Being a lightweight stick vacuum, you can easily vacuum floors and reach under furniture. If you have stairs, it is so much more convenient to lift it from stair to stair than a bigger upright vacuum. If your couch, bed, curtains or shelves need vacuuming, you just detach the wand and use the crevice tool and upholstery brush for smaller cleanups. Or in the case of larger debris like food pellets or cat litter, you just pick it up using the crevice tool and the strong suction. If you have a large house with a lot of floor area to vacuum, then a corded upright vacuum could be your number one choice for the main vacuum cleaner. But in smaller households and as a secondary vacuum for smaller chores a stick vacuum is an excellent choice. At only 4.5 lbs this stick vacuum is lightweight and easy to handle. As the weight of the vacuum is mostly in the part you hold, it doesn’t feel heavy when lifted up, and you can vacuum places like the corners of the ceiling without difficulty. The handle is ergonomic and feels comfortable in your hand. You can choose whether you want to use the trigger switch or not. It allows you to save power since the vacuum automatically shuts down if you release your grip to example move furniture out of the way. This way all the power is used for vacuuming, and not while the vacuum is idle. It’s convenient that you can choose to turn the vacuum from trigger mode to continuous mode, as some users prefer not to constantly hold the trigger even though it reacts to a light grip and will not strain your hand even when it is being used. Since cordless vacuums have become more powerful and efficient, they are becoming more popular. They offer convenience especially when it comes to small cleanups, as they are easy to grab for use and there is no plugging and finding power outlets. The vacuums come with a wall mount and mounting accessories for convenient storage. When placed in an easy-to-access place, you can quickly grab the vacuum for quick cleanups any time you have the need. When you have finished vacuuming, just pop the vacuum on the mount, attach the charger and your Deik will be ready and fully charged the next time you find your pet makes a mess. Again, there is a small shortcoming compared to the similar Dyson, as with the Dyson wall mount you don’t have to attach the charger separately. But as pointed out before, there is a difference in the price, and if your budget can’t be stretched this is just a small inconvenience that won’t be a problem. The runtime is pretty good at 25 minutes, which allows you to deal with quite a bit of vacuuming. For the full charge, you need the let the vacuum charge for 4.5 hours, which is pretty standard for this type of vacuum. Emptying and cleaning this vacuum is hygienic and quickly done. The dirt bin is see-through so that you can see when the cup is getting full. For emptying the dirt cup, you just release the bottom and dirt drops out. Remember to hold the vacuums closely above the trash can for the dust not to be released back into the air. The dirt cup can also be detached for washing when needed. Now and then you should also wash the HEPA filter. Just release the filter from behind the vacuum and rinse it under water to remove accumulated dust and other small particles. Let it dry completely before placing it back in. 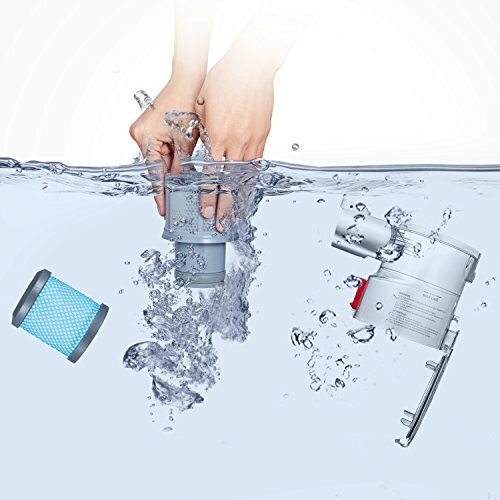 In addition to emptying the dirt cup and washing the filter, you might need to remove some long hair that can get tangled in the brush roll. Users did not find this to be a problem, but if you have pets with long hair some of it might wrap around the brush roll and needs to be removed once in a while. The Deik 2-in-1 comes with a washable HEPA filter to thoroughly remove allergens and other small particles from the exhaust air. This feature is essential for people with allergies, but also something other pet owners will find valuable. There is no reason why you wouldn’t want the air you breathe at home to be as clean as possible, and HEPA filter will take care of more than 99.97% of particles that have a size of down to 0.3 µm. Having a washable filter is convenient as well and saves you money. It is not a lifetime filter like the ones Dyson has and should be replaced every six months depending on how often you use the vacuum, although some users have reported the filter will last a lot longer if you remember to periodically wash it under lukewarm water to rinse out particles clogging the filter. And always remember to let the filter dry out for 24 hours before replacing it to avoid any mold. This Deik vacuum is on our top 5 list of stick vacuums for pet hair for a good reason. It hasn’t been on the market that long, but already it has gained great reviews from people using it. Also, pet owners have found this vacuum to be a great helper when wiping out pet hair and other pet-related messes, which is why it has quickly become one of the bestselling stick vacuums online. The Deik stick vacuum has a strong motor powering it and offering good suction. Also, it has a wide floor head with an efficient brush roll, which gets excellent reviews on its ability to pick up pet hair from hard floors and carpeting alike. This vacuum also comes with a brush tool with a rubber edge, which works well on upholstery. I would like to see a motorized brush tool added to the attachments, but the existing one does a good job according to users that reviewed this product for me. Being lightweight and easily maneuverable, you can use this vacuum for all the spots that gather pet hair in your home. High up and down low; you can reach everywhere to get rid of hair dander and dirt. For cleaning carpets, this vacuum does an excellent job being a relatively lightweight and compact vacuum. If you have carpeting all over and especially if it is a high pile carpet, you might want to have a more robust vacuum for getting to all the dirt ground deep in the carpet. But if you have low pile carpeting in only parts of your house, this vacuum will have no problem with thoroughly cleaning your carpets. The brush roll is handy in picking up hair and all kinds of dirt from rugs and carpets, and the strong suction will pull up all the dirt lifted up by the bristles. 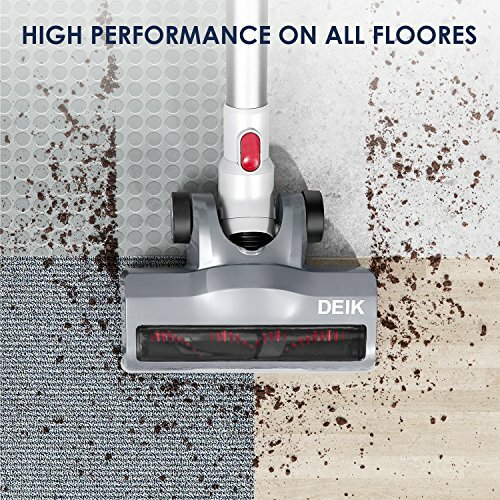 The Deik 2-in-1 gets good reviews on its performance on hard floors as well. You can not turn off the brush roll, but users say it won’t scratch your parquet or scatter dirt around when used on bare floors. 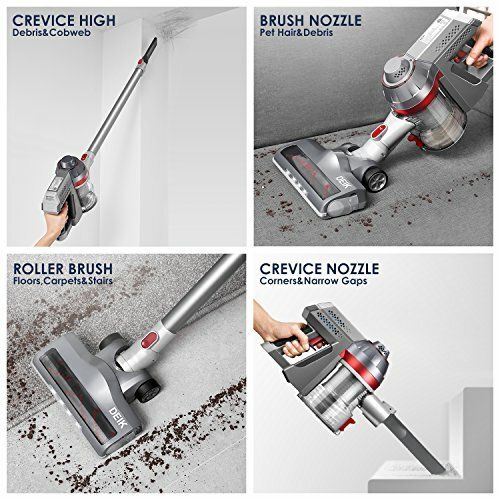 For vacuuming dust and finer dirt off the floor, you can use the swivel floor head with the brush roll, and for larger debris, you can take out the crevice tool. The suction is powerful enough to deal with cat litter, food pellets, and other heavier debris too. When it comes to cleaning upholstery, there are some pros and cons. 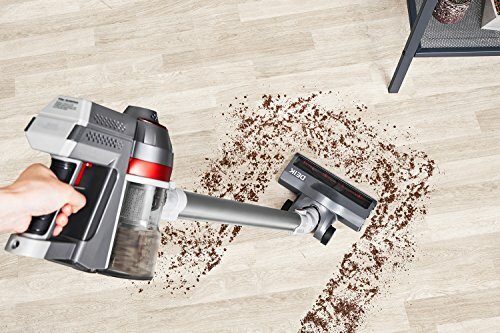 According to reviews and user experiences, this vacuum actually gets some pretty good ratings for doing an excellent job. Although there is no motorized brush tool, which I often find works the best for removing pet hair from fabrics, the existing upholstery tool seems to be working well. The upholstery tool that comes with the Deik vacuum has a soft rubber edge, which attracts pet hair and pulls it along for the suction to pull in. When compared to the Dyson I must say that Deik has to catch up in this area of pet hair removal, but again when taking the lower price into account, I would say this vacuum is a good purchase for someone needing to vacuum upholstery. The Deik 2-in-1 only comes with two attachments in addition to the floor head with the brush roll. There is the brush tool for upholstery that you can convert into an upholstery tool with rubber lining, and a crevice tool for tight places. 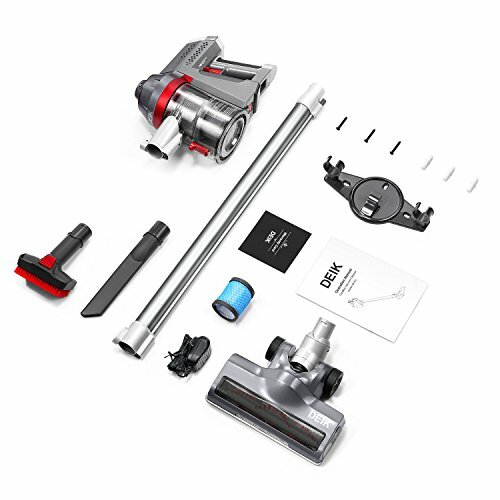 These attachments are sufficient, but as I am comparing this vacuum with the very similar Dyson, I have to point out that there are no add-ons to purchase separately if you would like to make your vacuum more adaptable. The crevice tool is rather standard but long enough, and it comes handy when vacuuming up bigger debris. The upholstery tool is not motorized, but it does come with stiff bristles and a rubber edge to catch better the pet hair clinging to fabrics. The floor head is quite wide, which is nice as you need fewer passes when vacuuming floors or stairs. It also swivels, which makes it easier to clean under and around furniture. Deik vs. Dyson: The Deik 2-in-1 stick vac resembles the Dyson stick vacuums in many ways, and therefore they are easily compared to one and other. 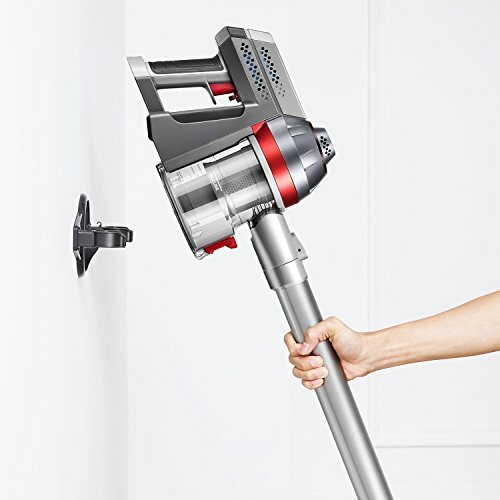 If your budget allows you to buy the Dyson, you'll get a more powerful vacuum. Although the features are similar, when it comes to pet hair - Dyson is the winner. However, the Deik 2-in-1 is an excellent vacuum cleaner with many great features and attention to detail in the design. It's a great lightweight all-rounder, with long run time, washable HEPA filter, and strong suction - all that, at a highly compatible price.